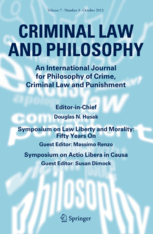 Criminal Law and Philosophy Vol. 2 No. 1 (January 2008). This article argues that, while Claudia Card is right to reject proffered excuses for torture, her strategy for demonstrating that torture is an evil and thus inexcusable is problematic. You can read the paper here. This entry was posted in all posts on liberalism, articles, liberalism by CChambers. Bookmark the permalink.